You’ve got the likes of Monster and Rockstar that are marketed as energy drinks but did you know that supplement brand Muscle Moose have a line of their own energy drinks called Moose Juice? I didn’t until I waltzed down the aisle of B&M Bargains on my dinner break one lunchtime and came across the cans in the drinks aisle. Available in Berry Flavour and Blue Raspberry, I decided to grab a can of each to see what Moose Juice was all about. As a rule, I do my best to stay away from carbonated drinks. Firstly, they bloat you up and make you burp a lot – not very pleasant. Plus, all the sugar isn’t that great either. The only time I’ve broken my fizzy pop abstinence in recent times was to indulge in a can of Irn Bru but since Barrs decided to march to the beat of the sugar tax drum and forfeited the delicious, girder-syrupy flavour in favour of the most heinous of sweeteners, aspartame, I’ve well and truly buried the Bru. Tired from work and needing something to perk me up before training, I figured Moose Juice could give me the boost I needed without the aspartame! 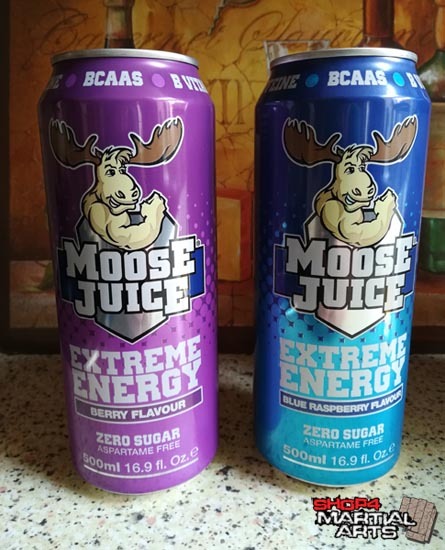 Containing BCAA (Branched Chain Amino Acids), zero sugar, Taurine and the energy bring itself, caffeine, Moose Juice has all the ingredients to make a potent energy drink. Being carbonated and having had energy drinks like Red Bull before now, I had reservations on what it might taste like but was pleasantly surprised by the results. Both Berry and Blue Raspberry taste as fruity as you’d imagine them to and are insanely refreshing without the carbonated fizz that you get with cans of pop. The flavour is much flatter with the gassy element kept to a minimum, so much so I thought I wasn’t even drinking a carbonated product. Warning, both flavours are very juicy and moreish that you can’t help but take another slurp. From an energy-providing point of view, Moose Juice is more than up to the task and made me quite alert which was a blessing seeing as I was wrestling training after work. Usually by 4pm I’m ready to snooze due to my line of work that requires a lot of concentration, but Moose Juice’s potency certainly perked me up and got my blood pumping for the grappling class. As someone who is quite caffeine sensitive, i.e. it doesn’t take much for me to get wired, Moose Juice does the trick without going overboard. The BCAA content also helps to battle muscle fatigue so you can go harder and longer at the gym or martial arts class before feeling tired. 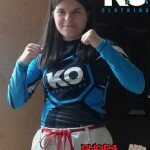 As a drink, it tastes delicious and would work well for those partial to the other energy drinks. Like most refreshing drinks, make sure to stick the can in the fridge and drink it chilled as it proper hits the spot! Moose Juice contains Carbonated Water, D-Glucuronolactone, Branch Chain Amino Acids (Leucine, Isoleucine, Valine), Taurine, Caffeine Anhydrous, L-Tyrosine, L-Carnitine, L-Tartrate, Pyridoxine Hydrochloride (Vitamin B6), Nicotinamide (Niacin), Choline Bitartate, Cyanocobalomin (Vitamin B12), Folic Acid, Flavouring(s), Acidity Regulators (Malic Acid, Citric Acid) and Sweeteners (Sucralose, Acesulfame Potassium). Each 500ml can contains 63kJ/15kcal of energy, 1.67g of carbohydrates, 2.2g of protein, 400µg of folic acid, 30mg of niacin, 40mg of vitamin B6 and 500µg of vitamin B12. Muscle Moose may be known for their protein mousse mixes but Muscle Juice is a quality energy drink that needs respect and deserves to sit alongside the more commercial brands as an energy drink of choice. utterly refreshing and fruity, the taste is sweet and thirst quenching whilst providing a potent burst of energy that will help see you through a workout. If your local B&M don’t stock the cans, 12x 500ml Moose Juice are available from Discount Supplements in Berry, Blue Raspberry and Green Apple flavour.